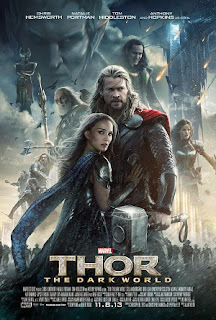 Starring: Chris Hemsworth, Natalie Portman, Tom Hiddleston, Stellan Skarsgard, Idris Elba, Christopher Eccleston, Kat Dennings, and Anthony Hopkins. Synopsis: Thor must save his the universe from a dark elf looking to utilize a powerful, ancient weapon. Now we're getting into the trenches of Phase Two of the Marvel Cinematic Universe with the release of THOR: THE DARK WORLD. While the original had its problems with pacing and being a tad on the boring side, there was one element that saved the film from being totally written off: Loki. Thankfully, the filmmakers learned from the problems of the first film, and not only fixed them, but ended up making one of the most solid and entertaining films in the Avengers world. This film picks up after the events of New York where Loki has been brought back as a prisoner of Asgard, and Thor is off fighting in the different realms making peace and hammering bad guys. All the while, we are introduced to our antagonist, Malekith (Eccleston), a dark elf looking to take over all the realms by use of a powerful, ancient substance thought to be destroyed (but of course, never was) called Aether, which coincidentally has bonded itself within Jane Foster (Portman). Malekith is looking to secure the Aether before all the worlds align during an event called "The Convergence" so he can bring darkness to all worlds. Thor, of course, must stop him! The plot really is the quintessential, cliche, though somewhat convoluted, superhero story of keeping a powerful weapon out of the hands of evil, but thankfully, the filmmakers make this story interesting with fun action scenes and dynamic characters. One of the major problems from the first that this film fixed was taking us away from Earth and spending the majority of the film on Asgard and various realms. It brought a real sense of scope and weight to this universe. Asgard is beautifully rendered and feels like an actual place rather than looking cartoonish. All the action is visually stunning and entertaining. Even the 3-D never made the pictures feel dark or muddled, though it really didn't add much to the overall experience of the film. However, the strength of the movie lies within the performances of the actors. Hiddleston, once again, steals the movie as Loki, and though he's not the movie's main antagonist, his presence and force is always present. He's the best and most complex antagonist, maybe even character, that has been portrayed within this universe. Even when he's not the focus of the plot, he is able to convey what his character is feeling with a clench of his fist or a nod of his head. Hemsworth is given more to do with Thor's character. Instead of making Thor just a love-sick puppy (he still is to a certain extent), there's a weight that he carries as he tries to balance where his heart versus where his duties lie. And both actors shine when they are given scenes together. Their chemistry feels natural, and some of their quips back and forth makes the film quite funny. Even though they are from another world, their relationship feels relatable to anyone living in the shadow of a sibling Now that we've had a couple films for these characters to breathe, this film lets them explore more of their complicated dynamic. One definite weakness of the film is the one-note bad guy of Malekith. Eccleston, who's also almost unrecognizable, is given next to nothing to do with the character, and there's no sense of purpose or reasoning behind his actions other than he's a bad guy and bad guys raise hell and make the universe dark. He ends up just being a catalyst to bring Thor and Loki together, which brings about the best parts of the film. A one-note bad guy doesn't make the film any less enjoyable, but Malekith ends up being very forgettable by the end. THE DARK WORLD is tons of fun and, in my opinion, one of the strongest Marvel films. The plot is a tad silly, but the characters, action sequences, and sassy dialogue completely makes up for any weaknesses the film might have.